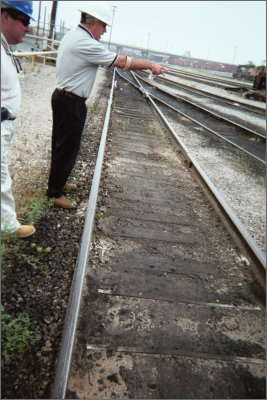 Problem area: Ballast, ties and track mats saturated with oil and diesel fuel for many years. Remediation: Oil Buster was applied to 40ft. of ballast and ties, approx. 1/16th of an inch thick, both between the rails and on the outside of the rails. Prior to this a sample of dirt and rock were taken from a marked location and sent to Microseeps, Inc. at the University of Pittsburgh Applied Research Center. A hydrocarbon saturation test was done on April 1, 2005, using modified method #8015. The test showed Semi-Volatiles (TPJ-DRO) at 12000. On May 10, 2005 samples from the same marked area, where Oil Buster had been applied, were tested again, using the Same method. The results showed the Semi-Volatiles (TPH-DRO) at 830. This is a 93% reduction over a 40 day period. (Approx. 5 weeks). As environmental compliance manager for a major rail system serving city and suburbs, you can imagine my environmental problems. In August of 2004 I was investigating my options to deal with petroleum pollutants. I spoke with a representative of Universal Remediation of Pittsburgh, PA and they agreed to do a test of their petroleum bio-remediation product, PRP, at a site of my choosing. At first I was skeptical that a powder-like substance applied to land or water surfaces could effectively lower hydrocarbon concentrations. We applied approximately 8 pounds of PRP powder over a 30 ft. by 4 ft. area of land and track ballast. I was told rain or moisture such as high humidity would help the product bio remediate. During the following forty days that the product was down we had no rain and very low humidity. In spite of such conditions, PRP reduced our hydrocarbons by 95%. This test was conducted by Earth Tech, Inc., an environmental engineering company tasked, by contract, to the rail company with handling all its environmental compliance issues.